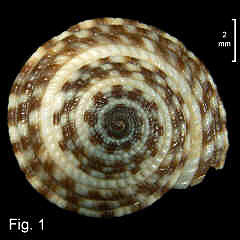 Description: Shell very variable in height to width ration and in umbilical width; spire convex in outline. Teleoconch whorls weakly rounded, with 4 strongly beaded spiral cords, the lowermost strongest, crossed by oblique grooves, the lowermost spiral constituting the peripheral cord on last whorl. Periphery with an additional, weaker cord below peripheral cord. Base weakly convex, with 4 beaded spiral cords between lower peripheral cord and umbilical margin. Umbilicus variable in width, averaging 25% of base width, with strongly toothed margin. 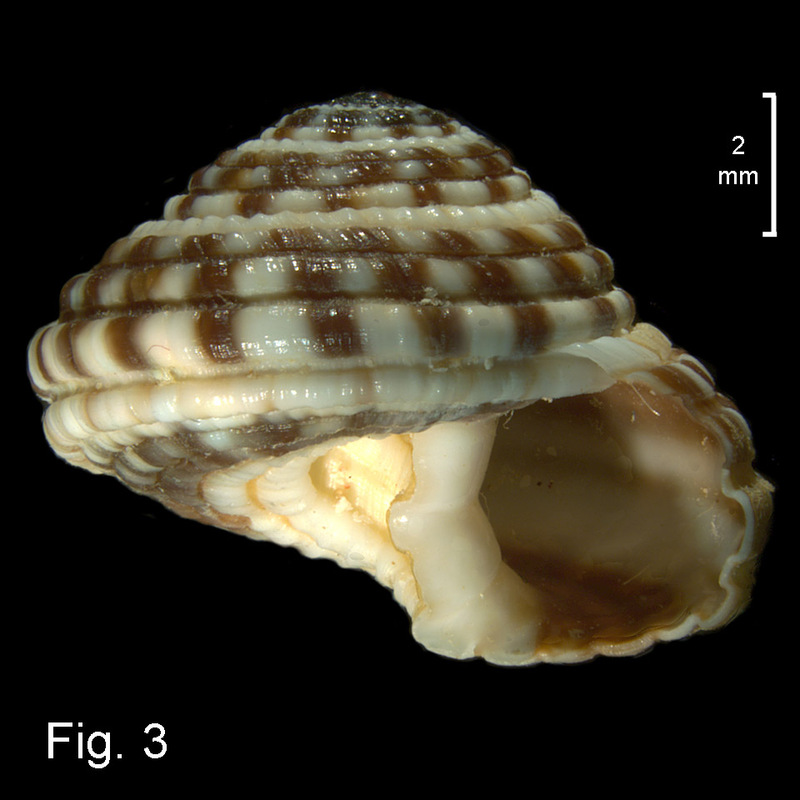 Colour bluish white with strong, distinctive brown to nearly black flames; peripheral ribs alternating white and brown, upper spiral cord sometimes unpatterned white. Size: Up to 18 mm in diameter in NSW. Distribution: Tropical Indo-West Pacific. In eastern Australia, as far south as Woolgoolga, NSW. Also Norfolk Island. 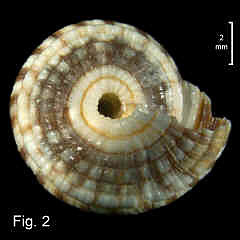 Habitat: Feeds on zoanthid polyps, intertidally and subtidally. (Bieler, 1993). Common. Comparison: This is the most common and widespread species of the genus. In common with some other species it has 2 cords on the periphery, but it is the most strongly sculptured of the genus in NSW, and is always darkly marked.